After weeks of family visits and work-related traveling, it was a relief to finally be able to retreat to hermitville aka my couch. I was long overdue for some hibernation… My first weekend back home, I went straight to my local market to stock up on enough food so that I wouldn’t have to leave my flat for the next 40+ hours. By the time I had shut my front door around noon, I had a fridge full of groceries, my favorite shows lined up on my AppleTV, and blankets awaiting on my couch. It was great to be back in my own kitchen, and at the Tiong Bahru Market that morning, I bought everything and anything that I remotely wanted to try cooking. I even picked up a sea bass from one of those closing flash sales which should concern me a lot more than they do. 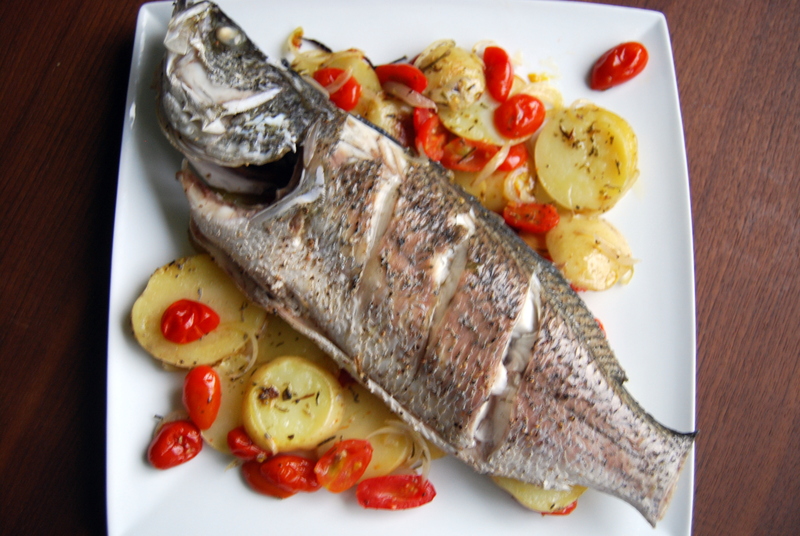 Originally I had thought I would do the usual Chinese-style steamed fish recipe. However, once I got home, I decided to kick it up a notch and tackle a cookbook that Natalya had bought me long ago but I had yet to really delve into: The Family Meal: Home Cooking by Ferran Adrià (of elBulli legends). Since it was a bit of a last minute decision to change recipes, I was not completely prepared to take on the recipe exactly as the book outlined. I had to settle for cherry tomatoes instead of regular ones, and dried herbs instead of fresh rosemary and thyme. But hey, the beauty of the family meal is the ability to improvise with available ingredients (okay the book doesn’t say that verbatim but I am sure Ferran would agree). I love this dish because it is simple to prepare and I’m fairly obsessing with roasting all my veggies. Furthermore, this dish echoes one of my favorite dishes from one of my favorite NYC restaurants, Bohemian, which does a whole roasted branzini on a bed of asparagus, mushrooms, zucchini, onions, green beans, potatoes, onions, olives, and whole garlic bulbs. Next time I make this, I will definitely be upping the vegetable varieties. Chef Adrià outlines how to clean the fish, but I’m fairly certain most of us have the option to ask the fish supplier to clean and gut it for us. I did remove the fins, gills and tail myself though with kitchen scissors as my knives were not up for the task. Make three deep cuts along the belly of the fish on both sides. Season the sea bass inside and out. Preheat the oven to 350°F (176°C). Thinly slice the onion. Coarsely crush the whole garlic cloves, leaving the skins on. Peel the potatoes and cut into slices about 1/2 inch thick. (I was using fairly waxy white potatoes so I left the skin on). Cut the tomatoes in slices 1/4 inch thick (I halved my cherry tomatoes). Poor a little oil into a large roasting pan. Spread half of the potato in the pan, then half of the tomato and half of the onion. Season with salt and pepper. Repeat the layers of potato, tomato, and onion. Scatter the garlic and herbs. Poor over most of the remaining oil. Cover the pan with foil, then back in the oven for 30 minutes. Remove the foil from the pan and put the fish on top of the vegetables. Turn the oven up to 375°F (190°C). Return the pan to the oven, uncovered, for 12 minutes, or until the fish is opaque and flake easily from the back bone. 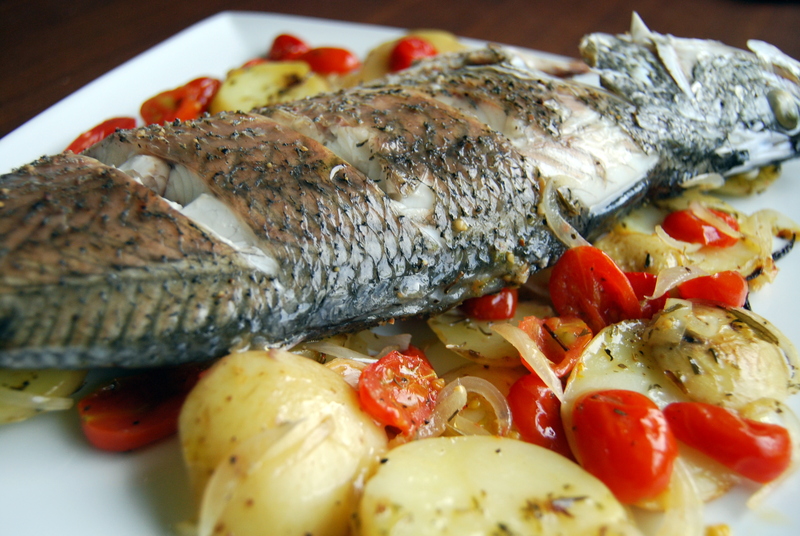 Sea bass is an incredible fish – so flavoursome and great to cook with. This looks fantastic.